If you've watched the local news last month you know that the Army Corps of Engineers has been releasing millions of gallons of fresh water from Lake Okeechobee down the Caloosahatchee River and that everyone is freaking out about it. I won't get into the politics involved here but the main fact is that SW Florida received a record rainfall in January, about ten times the normal amount, and the lake is seriously high. That water has to go somewhere or dangerous inland flooding could occur. Unfortunately, until billions of dollars are spent restoring the Central and South Florida ecosystems to the way nature originally designed them; some of that water is coming down our river. The result isn't pretty, but it also isn't the end of the world. This same situation happened two summers ago to an even greater degree. In fact, there was so much fresh water coming out of the Caloosahatchee in August of 2014 that I couldn't even taste salt in the waters just north of Matlacha. At the same time, there were more mullet than I'd ever seen on the Indian Fields and the snook, trout, reds and tarpon were all over the place. 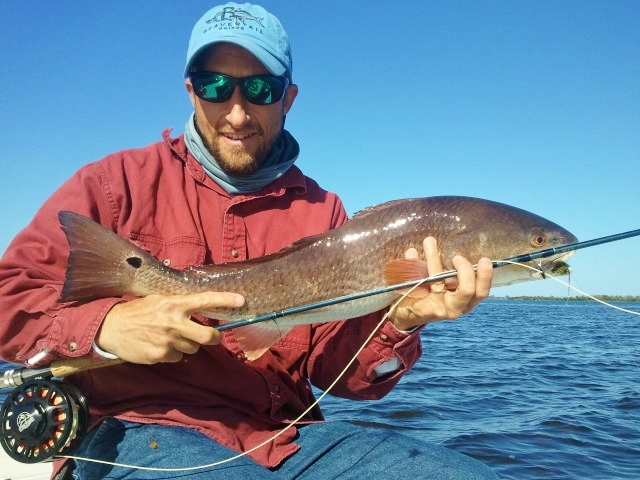 The truth is that all of our inshore fish can tolerate fresh water as long as the drop in salinity isn't immediate. So yes, the water coming out of the river is ugly and full of far more nitrates than we'd like to see but the fish in Matlacha Pass and Pine Island Sound are still out there and being caught despite all of that. We also hear a lot about red tides happening on many of our beaches last month. This is a naturally occurring bloom of algae that is found in warm salt waters all over the world. It is not a man-made phenomenon. In fact, dinoflagellate algae are one of the oldest living organisms on Earth and first appeared in the oceans about a billion years before actual fish came on the scene. Our most recent local red tide is caused by a toxic strain called Karenia Brevis, which is quite nasty. It can easily kill fish and is especially hard on the mullet population which actually eats algae as a main part of their diet. That's why the majority of dead fish on our beaches are various species of mullet and not the apex predators such as snook, reds or sharks which seem to be much better at avoiding these toxic areas. Red tide also causes breathing problems for anything with lungs such as turtles, manatees and even humans. High winds churning up the water mix these algae into the sea spray. For tourists at the beach this can mean a nasty and persistent cough. For manatees, dolphins, or turtles breathing in higher concentrations at the water's surface can lung failure and death. In fact, more manatees have died from red tide and cold weather over the last two years than boat accidents over the last decade. It occurs in relatively small pockets and hasn't impacted the entire Pine Island ecosystem in recent history. Unfortunately, our current outbreak seems to be concentrated along our beaches and the result is lots of unhappy tourists and negative media attention. So has the February red tide been caused by the fresh water release from Lake O? Probably not. Has it been made worse by this runoff? Maybe, no one has any real proof yet but it certainly isn’t helping. We’ve had several red tide outbreaks during drought years when no lake water was being released at all. None of these things are topics I'd like to be writing about but this is what dominated the news last month and the media always act like the sky is falling, which spills over into my business. If there is one silver lining to all of this it’s that it will hammer home the need to keep moving forward with the planned Everglades restoration. That’s the only thing that will make water releases down the Caloosahatchee a thing of the past. We survived these things in the very recent past and we'll survive it this time, too. As for now, the fish are still out there and we're still catching them. The water might not be crystal clear on the beach but don't let it spoil your fishing plans.